Their striking, distinctive carriage sets them apart: Their tails are held low, and in the male particularly is abundant and sweeping, like the tail of a pheasant. 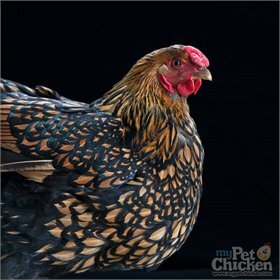 In fact, Sumatra chickens were once known as the "Sumatran Pheasant" and the "Java Pheasant Game." Males often even sport multiple spurs on each leg. However, what distinguishes them the most is their beautiful, jet-black skin and feathers. Sumatras are exceptionally stately birds, and with space to roam (and space to accommodate a tail that can be up to four feet long on a rooster!) 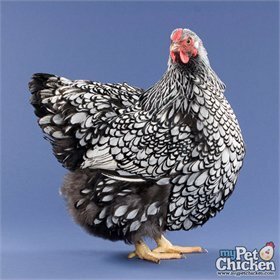 can be a wonderful addition to your flock. Close confinement does not suit them. 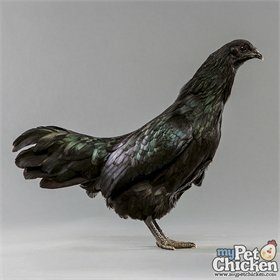 Sumatras make an excellent choice for exhibition, and--even better!--will make your other chicken-keeping friends green with envy!